The North America porcine vaccine market is highly fragmented owing to the presence of numerous large and small players. Zoetis, Inc., Merial Animal Health, Merck Animal Health, and Elanco Animal Health are the top four players that accounted for around 74.0% of entire market in 2015. Some of the other key palyers in the market are Bimeda Animal Health, Bayer AG., Boehringer Ingelheim GmbH, Vetoquinol, and Ceva Santé Animale. All these players are working on building diverse product portfolios, indulging in mergers and acquisitions, and investing in research and development activities in order to launch new and more effective vaccination for porcine. For example, Boehringer Ingelheim GmbH launched two new porcine vaccines ReproCyc and Ingelvac. 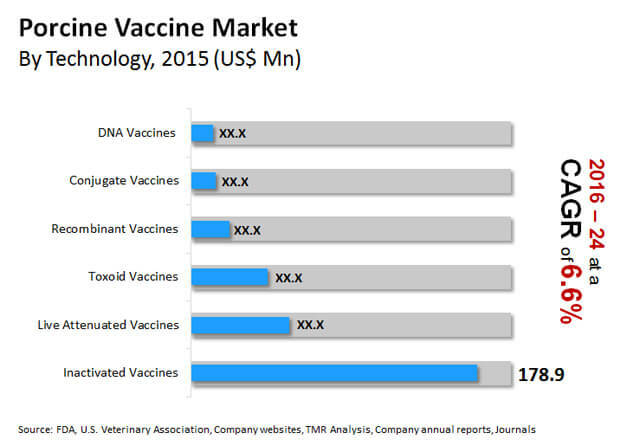 According to Transparency Market Research, the North America porcine vaccine market is likely to witness growth at a CAGR of 5.3% within the forecast period from 2016 to 2024. In 2015, the market was valued at US$540.9 mn, which is expected to reach around worth US$926.2 mn by the end of 2024. Geographically, the market is dominated by the U.S. It had a share of 63.0% in 2015. The market is anticipated to grow with a CAGR of 6.6% in coming years. Moreover, in terms of technology used, live attenuated vaccines are foreseen to exhibit growth with a robust CAGR of 5.9% within the forecast period. The market for porcine vaccines in North America is predominantly driven by the rise in prevalence of swine illness and the constantly growing demand for meat and gelatin in the market. Due to globalization and rapid change in atmosphere, the rate of outbreak of various ailments in animals are on the rise. These diseases are transmissible to humans. Since, pigs are an exceptionally popular source of red meat, consumed in high volumes around the world, the market for porcine vaccine is expected to be boosted in the near future. Zoonotic infections in this class of domesticated animals can be exceedingly wrecking for humans as well. Proper handling and storage of vaccines holds an important role in achieving high success rate against any vaccine-preventable illness. It is of absolute necessity to strictly comply with proper storage and handling process. Otherwise it causes loss of several dollars in revaccination and waste vaccine, requires keeping up proper cold chains. Such cold chains are required in all nodes of the supply network, beginning from the makers to the healthcare providers. The high expenses of maintaining and handling storage conditions is one of the major drawbacks experienced by the North America porcine vaccine market. This factor is anticipated to hamper the market's development to some degree within the forecast period. The market for porcine vaccines in North America is predominantly driven because of the rise in prevalence of swine illness and the constantly growing demand for meat and gelatin in the market. North America being third largest consumer of pork, becomes a key to rising focus on health and wellness of swine from livestock, driving porcine vaccine market.